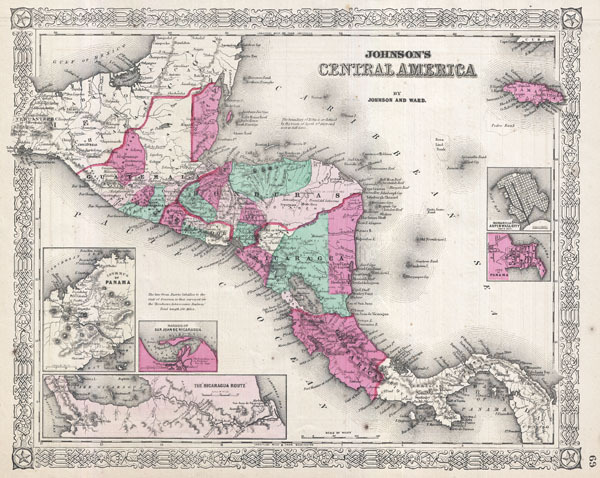 A beautiful 1866 example of Johnson's map of the Central America and Jamaica. Covers from the Yucatan southeast as far as Panama and north as far as Jamaica. Like most of Johnson's North America maps, this map is largely derived from an earlier wall map of North America produced by Colton and D. Griffing Johnson. Features several insets, including the Isthmus of Panama, the Harbor of San Juan de Nicaragua, the Nicaragua Route, Aspinwall City, and the City of Panama. Throughout the map, Johnson identifies various cities, towns, forts, rivers, rapids, fords, and an assortment of additional offshore and topographical details. Map is hand colored in pink, green, yellow and blue pastels to define national and regional boundaries. Surrounded by the fretwork style border common to Johnson's atlas work from 1863 to 1869. Published by A. J. Johnson and Ward as plate number 69 in the 1866 edition of Johnson's New Illustrated Family Atlas. This is the last edition of the Johnson Atlas to bear the 'Johnson and Ward' imprint. Very good condition. Overall toning. Printed text on verso. Else clean.